Former Undisputed Heavyweight World Champion Riddick “Big Daddy” Bowe will be the special VIP guest for the Feb. 22 edition of Golden Boy Boxing on ESPN at Fantasy Springs Resort Casino in Indio, Calif. The highly anticipated headlining matchup will feature 126-pound contender Joseph “JoJo” Diaz, Jr. (25-0, 13 KOs) defending his NABF and NABO Featherweight Titles against former world champion Victor “Vikingo” Terrazas (38-4-2, 21 KOs) in a 10-round fight. Doors to the Special Events Center open and first fight begins at 5:00 p.m. PT. ESPN2 and ESPN Deportes will transmit the fights beginning at 11:30 p.m. ET/8:30 p.m. PT, and streaming on ESPN3 starting at 10:00 p.m. ET/7:00 p.m. PT. A certified Hall of Famer, “Big Daddy” Bowe is known as the only Undisputed Heavyweight World Champion to have earned belts from all four main sanctioning bodies – WBC, WBA, IBF, and WBO. 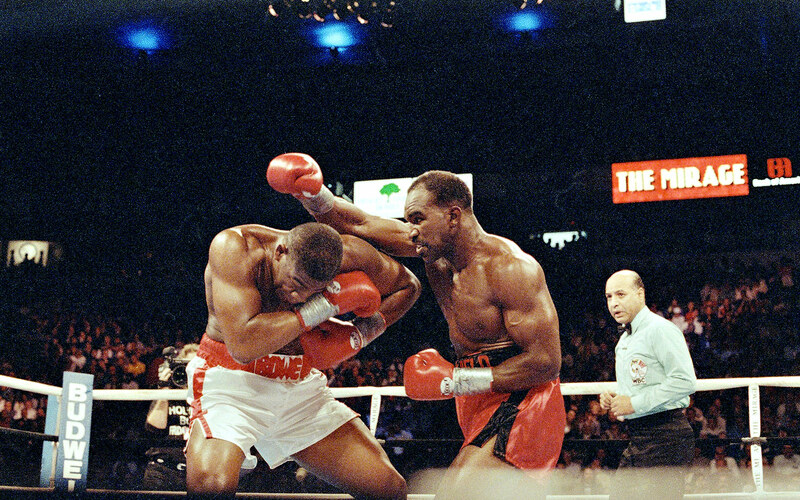 The controversial heavyweight faced some of the best fighters of his era, including Andrzej Golota, Evander “The Real Deal” Holyfield, Jorge Luis Gonzalez, Herbie “Dancing Destroyer” Hide, and Michael “Dynamite” Dokes. Bowe is also one of five former heavyweight champions to have never suffered a stoppage defeat in the span of more than 40 fights in his career. Bowe will be in attendance for this event to meet fans, sign autographs and take pictures inside the Fantasy Springs Special Events Center before the ESPN transmission begins. The meet-and-greet is open to the public with the purchase of a ticket to the event. Tickets for the event start at $25 and are available at the Fantasy Springs Resort Casino box office, by calling 1-800-827-2946, or by purchasing online at www.fantasyspringsresort.com. Chief support to the main event battle will be knockout artist Vergil Ortiz, Jr. (8-0, 8 KOs), who will participate in the eight-round co-main event for the vacant Junior NABF Super Lightweight Title against the dangerous Jesus “Carambolas” Alvarez (15-3,11 KOs) of Sinaloa, Mexico. Ortiz, Jr. has never heard the final bell of a bout and will be putting his spotless record on the line as he takes a step up in competition and fights for his first regional title. Lightweight knockout artist Christian “Chimpa” Gonzalez (18-1, 15 KOs) will make his highly anticipated ring return over a scheduled eight rounds of action and will kick off the ESPN3 coverage.Gonzalez will face Rey “Flash” Perez (21-9, 6 KOs), a Filipino fighter who now calls Los Angeles home and who was last seen giving Lamont Roach, Jr. trouble in the main event of the Nov. 30 edition of Golden Boy Boxing on ESPN. Manny “Chato” Robles III (14-0, 6 KOs), who is trained by his world-renowned father, Manny Robles, Jr., will participate in an eight-round featherweight affair. Power punching prospect Edgar “Kid Neza” Valerio (10-0, 7 KOs) of Ciudad Nezahualcoyotl by way of South Central, Los Angeles, Calif. will participate in an eight-round battle in the 126-pound division. San Diego’s Genaro “El Conde” Gamez (6-0, 4 KOs) will participate in an eight-round lightweight fight, and Hector “El Finito” Tanajara, Jr. (11-0, 4 KOs) of San Antonio, Texas will open up the stacked card at Fantasy Springs Resort Casino in a scheduled eight-round super featherweight fight. Opponents for all these exciting prospects will be announced shortly.